To a 14-year-old discovering drum corps performances through videos of the 1993 Drum Corps International World Championships, the activity was a magical, mystical entity that stimulated the imagination. To a 20-something law student, "drum corps" was a solid foundation of values that taught responsibility and hard work. To a 30-year-old attorney, the drum corps experience is a way to continually energize the soul, a way to engage in ever-evolving opportunities, and a way to provide an entertaining release from day-to-day routines. Luis Sanchez has experienced all those facets of the drum corps experience. He started his corps career in 1994 with the DCI Division III Twelfth Command of Taylor, Mich., inspired by the captivating memories of that 1993 World Championships video. After aging out of the Glassmen in 2000, he wasn't ready to walk away from the activity, so he returned to instruct the corps in 2001 and 2002 and later Carolina Crown in 2005 and 2006. Like anyone who has marched in a drum corps, Sanchez has picked up life lessons that have stayed with him as he ventured forth into his career. He gives credit to his drum corps experience for molding his work ethic and helping him become an attorney, saying, "Our instructors helped us persevere and realize that our inner potential often holds more than we think is possible. When I joined the percussion staff, the other staff members helped teach me the virtues of leadership, personal responsibility, and integrity. All of these values are of the utmost importance for an attorney to possess." Sanchez was looking forward to touring with the Glassmen in 2002 when he was accepted to the University of Michigan Law School. As a law student, he had the opportunity to intern with Judge Bruno Simma at the United Nations International Court of Justice in Den Haag, the Netherlands. The judge asked Sanchez how he organized his schedule, wondering how he found time to work for him while continuing his law school studies. He replied by citing an example of some of the 16-hour-day drum corps rehearsal schedules that would often run an entire week. Later, when Judge Simma came to the United States to teach a course at the University of Michigan (about some of the leading cases in international law decided by the World Court), he enlisted Sanchez's help as a guest lecturer. Sanchez admits, "My experience in drum corps helped me immensely with my confidence to perform as an instructor in front of my law school peers, with a World Court Judge looking on as my audience." After passing the Michigan bar exam, Sanchez accepted an opportunity to join the staff of Carolina Crown in the spring of 2005. There, he found his negotiation skills as a lawyer to be useful in post-show judging critiques. Within a year, however, he realized that being a lawyer and instructing a corps gave him no time to recharge his internal batteries. Though the time commitment of working with a drum corps become a lot for Sanchez in addition to his thriving career as an attorney, he has still found ways to keep in touch with his drum corps roots. He's an active fan and has already booked his hotel in downtown Indianapolis for this summer's DCI World Championships this August. 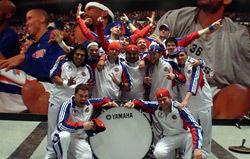 Members of the Detroit Pistons Drumline. Last summer, while attending an interview with a county prosecutor's office, he ran into fellow Glassmen alum Todd Ohme who has also been with the Blue Knights and Phantom Regiment. Ohme mentioned he was seeking to add some additional talent to the NBA's Detroit Pistons Drumline and inquired if Sanchez might be interested. Sanchez jumped at the opportunity to play with other members of the 19-person ensemble, who in addition to performing at Pistons home games, have backed up the likes of musicians Kid Rock and Keith Urban. The gig turned out to be the perfect way to balance Sanchez's love of drumming and drum corps with the intense demands of his career. Since his work as an attorney is largely an individual effort, the chance to become part of a fun team effort again was quite welcomed. Still, Sanchez had to practice hard to get his hands back into shape. But the hours needed to get his playing "chops" back have been repaid several times over. "Performing in front of sellout crowds at the Palace is an exhilarating experience and getting to put on the drum and just have fun with an awesome group of people is something that adds levity to my life, considering I routinely work on criminal trials," he says. 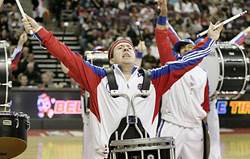 Fifteen years after viewing the DCI World Championships video, Sanchez has found that what he learned through his experiences with drum corps continues to offer him a magical, mystical ride through life, one that motivates him to get through his workday so that he can cut loose on the basketball arena floor, entertaining others as much as he entertains himself. Read more about Sanchez in this Flint, Mich. Journal article from December 7, 2008. Read more about drum corps in pro sports in this DCI.org article about the Chicago Bulls' Stampede.